0.1 Why Choose Bosch Tankless Water Heaters? With more than 350 subsidiaries across more than 60 different countries, Bosch is among the most reputable multinational engineering companies across the world. In terms of household appliances, Bosch water heaters are well-known and they are all over the world. The headquarters of Bosch Company is located in Germany. The company was founded towards the end of the 19th century by Robert Bosch in Stuttgart. Bosch offers a wide range of automotive components as well as the core products, electrical drives, from brakes, electronics and the steering systems to the packaging technology, household appliances, and power tools. In this Bosch tankless water heater reviews, you’ll find a deep insight into different types of the Bosch water heaters together with their main features. As a matter of fact, Bosch offers a complete range of several heater products electric heaters, wall-hung boilers and solar thermal systems. With each product that it designs, Bosch always aims at developing a technology which will not only make the consumers’ lives easier while also protecting the environment. If you’re planning to buy a tankless water heater from Bosch, then there are always plenty of Bosch water heaters to choose from. 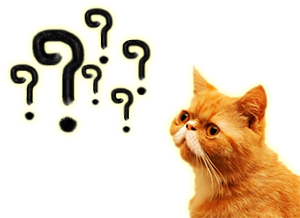 Why Choose Bosch Tankless Water Heaters? There are several reasons why one should opt for the Bosch tankless water heaters over the conventional tanks. For starters, the water heater’s on-demand technology normally allows you to save a lot of energy since the water heater only turns on the moment when you require hot water. Traditional tank water heater models operate 24 hours daily in the continuous cycle of heating as well as re-heating water. Over time, the water heater becomes less efficient since the sediments tend to be building up at the bottom of the water heater’s tank. As a result, the heat doesn’t effectively reach water through the buildup thus leading to high utility bills. With a Bosch water heater, your utility bills will be drastically reduced. Many of the brand’s models also qualify for the federal tax credit of up to 30 percent. Bosch also eliminates the problem of “cold water sandwich” by supplying unlimited supplies of hot water thanks to the modulating burners technology. The technology also allows a person to precisely control the temperature of the heater. A Bosch tankless heater doesn’t only save you cash in the day-to-day operations but it’s also a worthy long-term investment. Unlike the traditional tank-type heater that has the maximum lifespan of twelve years, a Bosch tankless heater has been designed to last for over 20 years. Bosch normally has a line of heaters designed for both commercial and residential consumers. Bosch understands well that homeowners are always looking for a reliable and convenient source of the hot water, paired with utility cost savings and a good warranty. Conversely, Bosch provides the commercial establishment’s high demands, with some heaters designed so as to provide more than 12 gallons each minute. 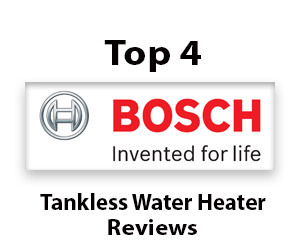 The reviews that Bosch tankless heaters received have always been generally positive. Several buyers who are good at the DIY jobs normally have no trouble in installing the tankless units by themselves. This helps them save on the installation costs. The heaters only consume power when hot water is required. With so many Bosch models to choose from, buying a tankless water heater is always a daunting task. Understanding your home needs and the important considerations enables one to make informed purchasing decisions and select a water heater model that best suits your needs and lifestyle. This tankless heater is powered by propane. 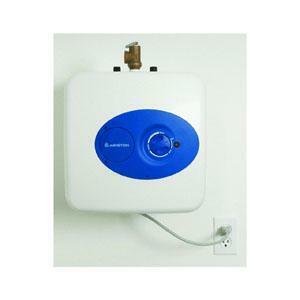 This small tankless water heater is also ideal for applications where smaller volumes of hot water are desired. Piezo ignition system: It uses the Piezo ignition to push up buttons. Moreover, the heater runs automatically provided there is propane. It also has no need for supervision and does not need batteries or electricity to function. This makes this water heater a perfect solution for areas like cottages, cabins or camps. 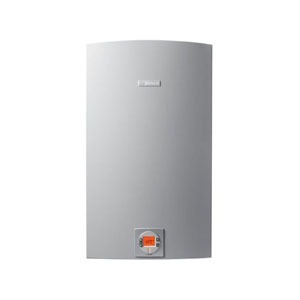 Modulating gas valve: The Bosch Therm 330 PN water heater also utilizes the modulating gas valve to make sure that a constant temperature is maintained at different flow rates. 78 percent thermal efficiency: This amazing heater gives a maximum input of 75000 BTU. This makes this heater more than 78% efficient. Galvanized B vent: This process is also called natural vent. In this process, you can vent the combustion fumes outside. Cons: It is a very small unit, weighing only 24.6 pounds. Although it is great for smaller applications, it is not very efficient for a larger household. Its compact size means that you save the valuable floor space. It is also available in both liquid propane (LP) and natural gas (NG). Bosch is among the well-known natural gas heater brands which come up with a series of water heaters from time to time. 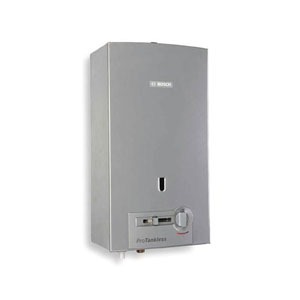 The Bosch Therm 520 PN is one such popular tankless water heater brand which was introduced into the market in 2011. The natural gas tankless heater also utilizes the modulating gas valve in order to ensure a constant temperature at different flow rates. Piezo ignition system: The Bosch Therm 520 PN has the pilot light and also offers a Piezo push-button ignition system. Therefore, you will not need any electrical connection to run this heater. 5.3 GPM: This heater has a capacity of providing 5.3 gallons of hot water per minute. And it can do it at 35F degree rise. It has a minimum activation flow rate of around 0.5 gallons/minute. 78% thermal efficiency: The heater has a 117,000 BTU maximum input. Therefore, it has a 78 percent thermal efficiency. Cons: Since it uses B-vent, the venting cost is relatively higher. Other than that, this is an amazing water heater. The Bosch Therm 520 HN is the perfect tankless water heater for smaller households and families that only use less than two hot water appliances at a time. The Bosch 830 ES LP Gas Tankless Heater is a higher capacity, non-condensing and indoor tankless heater for the busy households at a small BTU output. It is able to cascade up to 24 units. 8.3 GPM: This heater has the ability to deliver 8.3 gallons of hot water per minute. And this water heater can do it at 35-degree rise. 83%+ thermal efficiency: This tankless heater from Bosch uses propane as an energy source in order to provide a very impressive 175,000 BTU per hour heating element. The Bosch’s strive in providing greater durability and efficiency allows the C 830 ES model to maintain an 83 percent thermal efficiency rating and a 0.83 overall energy factor. Electronic ignition and patented burner design: this amazing water heater needs electronic ignition. And their burner design is also patented. With advanced technology and safety measures, Bosch offers you maximum efficiency. Cons: This is a model designed for larger households. So, if you have a small household, this unit is not suitable for you. Your Bosch water heater application will certainly reap the benefits of having continuous running hot water even without one having to pay the costly effects. In comparison to the conventional tankless water heaters, the Bosch 830 ES Water Heater reduces the cost that is yielded by gas and electrical over usage. 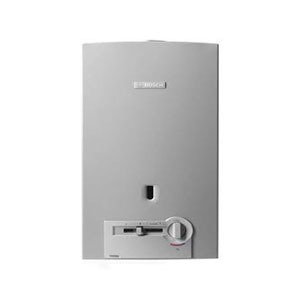 The Bosch GL4S Ariston 4-gallons point-of-use mini tank heater is another top-drawer water heater model from Ariston and Bosch, two of the largest names in the water heater’s market. You can either install the heater independently or even inline together with a bigger heater. In addition, it can store four gallons of hot water which are more than enough for regular use. Point-of-use heater: Since it is a point-of-use heater, you do not have to worry about its installation since it features a play system and a plug. The heater is good to use under the sink just by simply plugging in Bosch Ariston GL4S. Temperature adjustment knob: this amazing feature gives GL4S Ariston superiority over the older model. In this new model, there is a temperature adjustment knob in front of the heater in order to increase or decrease the temperature from 65 to 145 degree F.
Improved thermostat: Bosch Ariston GL4S comes with an advanced technology thermostat. It features a new sensing probe. This thermostat helps the heater adjust the temperature more efficiently and provide constant heat. Cons: the warranty for this unit is not up to the mark, compared to other Bosch units. Other than that it is a great unit. This heater is ideal for the cottages, camps and almost anywhere a smaller volume of hot water is required. The GL4S is among the highly flexible mini tank heaters that you’ll ever find. For over a century, Bosch has been enjoying a reputation as being a world-class supplier and innovator in the industries of automotive, consumer goods, building as well as industrial technology. In most parts of the world, the revolutionary Bosch’s Thermo technology paved the way for the line of efficient water heating systems. To sum it up, Bosch Company offers a wide range of water heaters. The heaters come in different sizes and shapes, they are very easy to handle and also install. Furthermore, they are designed to always protect the surrounding environment through the reduction of energy as well as water consumption. These heaters are cost-effective solutions to improve the comfort of any home. The bosch tankless are a big rip off. Lasted us only 5 years. Would never buy from them again. Navian is the way to go.